Carbonaceous chondrites are thought to be a potential source of early Earth’s volatile elements — including hydrogen, nitrogen, and carbon — and possibly organic material. Meteoroids slamming against the atmospheres of alien worlds could add organic gases that make them look inhabited by life even if they are not, researchers say. In recent years, astronomers have detected hundreds of extrasolar planets. Many of these exoplanets lie within habitable zones, the zones around their stars warm enough for liquid water to persist on a planet's surface, raising hopes that life as we know it might live on these distant worlds. Ground-based observatoriesand proposed-but-cancelled spacecraft such as the European Space Agency's Darwin project or NASA's Terrestrial Planet Finder could scan the atmospheres of exoplanets for signs of extraterrestrial life. Molecules each absorb specific types of light, resulting in patterns known as spectra that allow scientists to identify what the molecules are. Some chemicals or combinations of chemicals might be unique to life as we know it, and could thus serve as strong evidence of aliens. This image shows concentrations of methane discovered on Mars. For more than 40 years, hints of methane have been seen on Mars, the first organic compound seen there. In the last decade, researchers have even suggested they have seen methane clouds that may have been forming over the Red Planet during the summer months in the last decade, raising the possibility of past or even extant organismsjust below the surface, although these findings remain hotly contested. Although life or the byproducts of life are responsible for nearly all the methane found in Earth's atmosphere, it is not the only source of the gas. For instance, volcanism can produce methane, as can chemical reactions between water, carbon dioxide and minerals. Another potential source of methane are carbon-rich micrometeoroids that generate the gas as the compounds in them burn up while entering a planet's atmosphere. Our solar system's main asteroid belt happens to be dominated by carbonaceous asteroids. Although the number of micrometeoroids hitting Mars would not explain the levels of methane seen there, exoplanets in much dustier systems could potentially have enough methane produced in this manner to give off a false atmospheric signature of life. "This could pose a problem, since the search for life on these exoplanets is dependent on remote observations such as spectroscopic analysis of their atmospheres, as had been used to detect the methane in the atmosphere of Mars," said researcher Richard Court, a planetary geologist at Imperial College London. "There is no chance of spacecraft physically visiting these exoplanets many light years away in the foreseeable future." Past research suggests the only systems likely to possess debris disks dense enough to mimic a methane signature of life are either very young, or systems undergoing a massive set of collisions, such as was the case in our solar system during the Late Heavy Bombardment about 3.9 billion years ago, when millions of rocks cataclysmically blasted Earth and the rest of the inner solar system over a roughly 100-million-year period. "Astronomers have been able to observe events analogous to the Late Heavy Bombardment occurring in other star systems," Court said. When an exoplanet passes in front of its star from our point of view, atoms in its atmosphere absorb some of the starlight at specific wavelengths. These wavelengths form a unique fingerprint, allowing scientists to identify the presence of specific gases in an exoplanet's atmosphere. To see how much methane carbonaceous micrometeoroids might generate on exoplanets, scientists calculated what an early, dustier version of our solar system was like. Currently Earth receives about 40,000 metric tons of micrometeoroids annually, while Mars sees about 12,000 metric tons. The researchers estimate that during the Late Heavy Bombardment, Earth and Mars saw about 1,000 to 10,000 times more. During the entire Late Heavy Bombardment, Earth may have received about 33 million billion metric tons of micrometeoroids, while Mars received 1.7 million billion metric tons. This all may be enough for an exoplanet to have enough methane to make it look as if it might have life. "These are the first people to address exoplanet atmospheres as they relate to micrometeoroids that produce methane upon atmospheric entry — people working with exoplanets hadn't thought of this before, and it's cool and something we should be aware of," said planetary scientist Sara Seager at the Massachusetts Institute of Technology, who did not take part in this study. 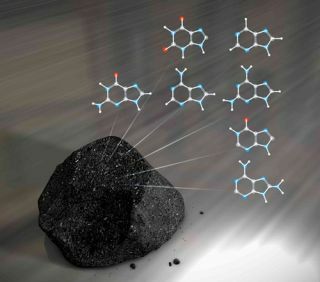 Court did caution that they assumed that the chemistry and abundance of the organic matter in micrometeorites falling to Earth is similar to that of micrometeorites in other star systems. "While some differences are inevitable, it is likely to be a reasonable assumption, because a search for evidence of life on planets outside the solar system will naturally seek to investigate a star system as similar as possible to ours," he said. So far astronomers have detected a number of exoplanetary systems that may possess both planets and debris disks. One example may include Gliese 581 about 20 light-years from Earth, which has one and maybe two "super-Earths" — rocky planets larger than our own that can reach up to 10 times Earth's mass — around the red dwarf of the system's habitable zone. "As we observe more star systems, it will be possible to apply our work to more extrasolar planets," Court said. Court and his colleague Mark Sephton detailed their findings online Sept. 6 in the journal Planetary and Space Science.